This paper outlines regulations governing the entry and immigration of expatriates to work for a foreign or Vietnamese entity in Vietnam. We deal first with visas and residency and then with work permits. Inter-Ministerial Circular No. 04/2002/TTLT/BNG-BCA of the Ministry of Foreign Affairs ("MOFA") and the Ministry of Public Security ("MPS"), dated January 29, 2002, providing Guidance for Implementation of Decree 21. It was amended by two Inter-Ministerial Circulars of the MOFA and the MPS; one is No. 01/2007/TTLT/BNG-BCA dated January 30, 2007 and the other is No. 01/2012/TTLT/BCA-BNG dated January 3, 2012. According to the Ordinance and Decree 21, an expatriate and his/her family members may obtain multiple-entry visas with a duration of 12 months if the expatriate comes to Vietnam in order to work: (i) for a foreign invested project (i.e., a foreign invested enterprise ("FIE") or in connection with a business cooperation contract ("BCC")); (ii) under a cooperation contract with a Vietnamese entity; or (iii) for the office (either a branch or a representative office) of a foreign organization in Vietnam. While the Ordinance does not appear to contemplate the issuance of a visa to an expatriate employed by a Vietnamese entity2, this is clearly an oversight, and we conclude that such an expatriate may obtain a 12-month, multiple-entry visa, perhaps under category (ii) above. Vietnam made broad commitments as part of its WTO accession3 ("Vietnam's WTO Commitments") with regard to the immigration of expatriates working as managers, executives or experts in a foreign "commercial presence4" in Vietnam. Where the two overlap, Vietnam's WTO Commitments supersede the Ordinance. A commercial presence has since been specified to include a representative office, branch, or subsidiary (i.e., an FIE) or a BCC office. An expatriate transferred from abroad to work for the commercial presence of a foreign entity in a position of "manager", "executive" or "expert" may obtain a renewable entry visa with a duration of even more than three years. The difference between the Ordinance and Vietnam's WTO Commitments is the duration of the visa. According to the Ordinance, visas can only be issued for a duration of 12 months or less, while under Vietnam's WTO Commitments, the duration can be three years or more. In practice, the Government still grants visas for 12 months or less. It is not clear when three-year visas will be available. "Managers" and "executives" can be persons who manage an FIE, a branch or BCC, and report only to the board of directors or shareholders. Management responsibilities include directing the FIE, the branch, or the office of the BCC themselves, or directing a department, division or independent unit. Management responsibilities also consist of supervising the performance of other supervisory, professional or managerial staff, including recruiting and dismissing staff. It appears that managers and executives can only manage the "supply" of services or production, but cannot themselves provide the services or be involved in production. This is limiting in certain businesses, for example, a software, architectural or similar service provider in which a manager both manages the operations and provides services to his/her clients. An "expert" is defined as a person who has a bachelor's degree or higher, or is qualified at the level of engineer and has at least 5-years experience in the speciality in which s/he was trained. The Law on Investment5 generally allows foreign investors, foreign experts and technicians who work permanently on an investment project to obtain a renewable multiple-entry visa to Vietnam with a duration of up to five years. However, there is no supporting language in the Ordinance or in Vietnam's WTO Commitments, nor anywhere else. Of note, the draft Law on Investment dated September 6, 2014 has removed this provision, and the matter is now regulated in the Immigration Law. 30-day-visas issued by an overseas Vietnamese visa-issuing authority (say, a Vietnamese Embassy). Visas can be renewed, provided that conditions for original visa issuance continued to be met. The Immigration Law prohibits changing the purpose of a visa. For instance, an expatriate will no longer be able to change from, say, a tourist visa to working status. a) Exemption under international agreements, protocols, etc. As of June 2014, Vietnam has reached entry visa exemption agreements with 81 countries.6 However, most of these agreements only grant an exemption to a person with a diplomatic or public affairs passport. An entry visa exemption for persons holding ordinary passports and staying in Vietnam for 30 days or less is granted under Vietnam's agreements with Thailand, Malaysia, Indonesia, the Philippines, Singapore, Japan, Republic of Korea, Denmark, Sweden Norway, and Finland. Such exemptions are also granted to Russian citizens holding ordinary passports and staying in Vietnam for 15 days or less. According to Decision No. 135/2007/QD-TTg of the Prime Minister, dated August 17, 2007 (as amended by Decision No. 10/2012/QD-TTg dated February 10, 2012), an overseas Vietnamese is exempt from a visa to enter Vietnam if that person has obtained a certificate of visa exemption issued either by a Vietnamese diplomatic office abroad or by the Immigration Department of the MPS. A person with a certificate of visa exemption may stay in Vietnam for up to 90 days upon each entry. * Guarantee letter from a Vietnamese national. A similar visa exemption is also available to the spouse and children of an overseas Vietnamese. A certificate of visa exemption for an overseas Vietnamese and his/her spouse or children is valid for up to five years and is renewable. a) Temporary Residence Card "TRC"
An expatriate who has stayed in Vietnam for at least one year may apply for a TRC from the Immigration Administration. With a TRC, an expatriate can stay in Vietnam without a visa. According to the Ordinance, a TRC can have a duration of up to three years, subject to the cardholder's term of employment. However, it is unclear from the Ordinance whether a TRC can be renewed or extended if it expires during the expatriate's employment. In practice, the term of TRC should be consistent with the term of the cardholder's work permit. Currently, the term of a work permit is a maximum of two years, and the TRC is renewed after two years if the cardholder remains employed. The term of a TRC is rather different under the Immigration Law. The New Law classifies TRCs into several categories with three different terms. For example, a foreign investor, a foreign lawyer or an overseas student can obtain a five-year TRC; a chief representative of a foreign trader's representative office/branch can be issued a TRC for up to three years; and a foreign employee can be issued a TRC for two years. A manager, executive or an expert transferred from abroad to work for the commercial presence of a foreign entity in Vietnam, may receive an extendable TRC with an initial term of three years. To qualify, the employee must have been employed by the foreign enterprise for at least one full year. A manager, executive or expert who is recruited by the commercial presence of a foreign entity may be granted a TRC for the duration of his/her employment contract or for an initial period of three years, whichever is shorter. A TRC may be extended, subject to the duration of the employment contract. A PRC may be granted to an expatriate who resides temporarily in Vietnam and is the spouse, child, or parent of a Vietnamese citizen who resides in Vietnam. An expatriate with a PRC can stay in Vietnam without a visa. Ironically, PRC must be renewed every three years. The Immigration Law broadens the scope of expatriates who can be issued PRCs. Persons who have no nationality and have resided temporarily in Vietnam since before 2000. An expatriate who has resided temporarily in Vietnam for three or more consecutive years, and is sponsored by his/her parent, spouse, or child who is a Vietnamese citizen and has permanent residence in Vietnam. Expatriates in these categories must submit a dossier to the immigration authorities to establish entitlement. The immigration authorities will issue a renewable PRC valid for ten years. Official letter No. 2779/LDTBXH-VL of the Ministry of Labor, War Invalids and Social Affairs dated August 4, 2014. An employer must prepare a plan to recruit expatriates for each job for which Vietnamese do not qualify, and file such plan, 30 calendar days or more prior to the proposed recruitment. It must be filed with and approved by the Chairman of the provincial People's Committee.8 This is a compulsory step in order for an expatriate to be issued a work permit. The expatriate must have a work permit issued by the Department of Labor, War Invalids and Social Affairs ("DOLISA"), except where exempt. In addition, a foreign technician who has been trained one year in a technical speciality and has at least three years' experience in that speciality, can apply for a work permit if s/he meets the above conditions. Decree 102 no longer contains a limitation on the number of expatriates that can be recruited by an employer. An entity in Vietnam, including a foreign entity's commercial presence or a Vietnamese entity, can recruit a qualified expatriate to work for it as a manager, executive or expert. A foreign entity may transfer a manager, executive or expert ("intra-company transferee") to its commercial presence in Vietnam. To do so, the intra-company transferee must have been employed by the foreign entity for at least 12 consecutive months. An expatriate may work in Vietnam to perform a contract between a foreign entity and its Vietnamese counterparty, which contract requires the use of an expatriate's service. An SSP is an expatriate worker who neither lives in Vietnam, nor receives remuneration from any source whatsoever in Vietnam, and participates in activities that involve the representation of a service provider in respect of the service, provided that s/he neither provides the services nor sells the services to the public. n. implements an international treaty to which a Vietnamese Government authority, a provincial body or a central socio-political organization is a signatory. Vietnam made a commitment in respect of employee immigration in the tourism industry in 2009. It is the ASEAN Mutual Recognition Arrangement on Tourism Professionals ("MRA-TP"). The MRA-TP will take effect in ASEAN in 2015. Under the MRA-TP, Vietnamese may work in ASEAN member countries and vice versa. It is likely that a significant number of employees in the tourism industry will enter Vietnam to work. In order for an expatriate to be exempt from a work permit, the employer must file an application with the provincial labor authority to confirm the exemption. Document to prove that the expatriate falls into an exempt category. A document in a foreign language need not be legalized, but it must be translated into Vietnamese and the translation must be notarized. An employer or the counterparty of an employer in cases in which the employee meets conditions set forth in Section B.1.b), must prepare an application for the expatriate's work permit. The process by which a work permit is issued is discussed below. An application for a work permit must be filed with the DOLISA of the province in which the Vietnamese entity/counterparty is located. It must be done at least 15 working days prior to the date the expatriate is scheduled to start working in Vietnam. An employer (or the counterparty) in Vietnam will normally receive the work permit from the DOLISA within 10 working days from the date of filing, and must then deliver it to the expatriate. As issuance of a work permit can be delayed, filing timelines should take this into account. Moreover, filing should be coordinated with recruitment timelines discussed at Section B.1.a). The work permit requirement applies equally to an expatriate working for the commercial presence of a foreign entity and an expatriate working for a Vietnamese entity. We have discussed exceptions in Section B.2. above. A work permit is specific to an employer. If an expatriate wishes to work concurrently for another employer in Vietnam, then, even if his/her current work permit is valid, the expatriate must obtain another work permit. A judicial record issued by an authority (i.e. a judicial or law enforcement agency) in the country in which the expatriate resides, showing whether the applicant has a criminal record. Documents to certify that the expatriate is a manager, executive director, expert or technician. They are documents which prove either the expatriate's professional qualification or his/her required working experience. Professional qualification can be shown by diplomas, degrees, or skill certificates where an expatriate is a craftsman, soccer player, pilot, or aircraft maintenance person. Required working experience should be at least five years for a foreign expert, and three years for a foreign technician. Two passport photos [4cm x 6cm] taken within the six months prior to the filing date. Finally, the endorsed document must be either: (i) legalized by the Vietnamese Embassy/Consulate in the Country of Origin, or (ii) authenticated by the Embassy/Consulate of the Country of Origin in Vietnam, and then legalized by the Vietnamese MOFA. A notarized Vietnamese translation of a legalized document is also required. If the specific document is made in a foreign language, it does not have to be legalized, but it must be translated into Vietnamese and the translation must be notarized. Upon receipt of a work permit, the employer and the expatriate must enter into an employment contract. Within five working days from the date of the employment contract, the entity at which the expatriate works must send a copy of the employment contract to the DOLISA. 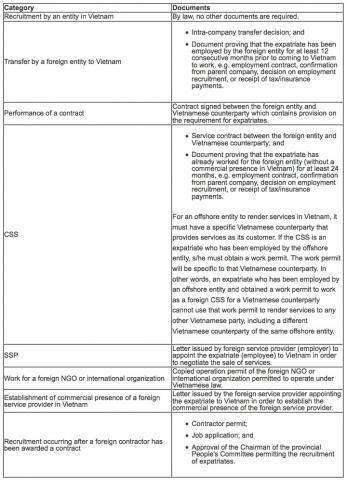 This requirement only applies to an expatriate recruited by a commercial presence of a foreign entity in Vietnam or a Vietnamese entity. term of appointment for the expatriate to establish a commercial presence in Vietnam. A work permit is no longer extendable. That is, when a work permit expires, a new application for a new work permit must be made. See discussion below. (i) The current work permit is lost, damaged; or there are changes which must be recorded in the work permit, such as: change of name, date of birth, nationality, passport number or working location. (ii) The current work permit expires. At least five days but no earlier than 15 days prior to the expiry of the work permit, the employer must file an application with the DOLISA for reissuance of the work permit. Documentation for reissuance of a work permit is less complicated than that required for an initial work permit. Specifically, the employer is not required to submit the judicial records, documents confirming professional qualifications/skill certificates and required working experience, nor copy of a passport as required in the standard documents--Section B.3.b(i) above. two passport photos [4cm x 6cm] taken within six months prior to the filing date. The competent DOLISA will re-issue a work permit within three working days from the date of filing a complete application. After receipt of the re-issued work permit, if an employment contract is signed, its copy must be filed with the DOLISA that re-issues the work permit, within five working days from the date of the employment contract. The expatriate is imprisoned, dies or is missing as determined by a court. Decree No. 154/2005/ND-CP guiding the Law on Customs No. 29/2001/QH10 (as amended in 2005 by Law No. 42/2005/QH11) ("Decree 154") regulates customs procedures, inspection, and supervision. Under Article 35 of Decree 154, an expatriate who brings personal effects into Vietnam has to submit: (i) a customs declaration; (ii) a detailed list of assets; (iii) a bill of lading; and, most importantly (iv) written certification of his/her permission to work in Vietnam, issued by a competent authority (i.e. a work permit). This requirement for a work permit for customs clearance purposes is currently provided for in the Labor Code. In conclusion, except in the case of exemptions, a work permit is mandatory. An expatriate who works in Vietnam without a work permit may be deported within 15 working days from discovery. The employer's operation may be suspended for three months, and a maximum penalty of VND 75 million (approximate US$ 3,600) may be applied to the employer who employs an expatriate without a work permit.